The race for the golden crown is fiercely on as some damsels are pulling in quite interesting figures in this year’s on-going MISS PALMCHAT competition. The best of the best are slugging it out and the votes from admirers and fans alike are flooding in, who will reign supreme in this beauty arms wrestling? The hottest of shapes, sexiest of smiles, prettiest of faces and the most sensual of eyes (I tell you there are beautiful girls in Nigeria o …judging by the selfies I’ve seenJ) are raking in figures on the competition’s microsite. Ok, babe if you think you are pretty and you know that a lot of people think the same thing too about you…girl then it is high time you join the MISS PALMCHAT contest! · Invite friends on Palmchat to send virtual online gifts (like a heart…maybe) to your Palmchat ID. For each free virtual gift you get from a friend, admirer or a fan through your Palmchat’s social platform, your Tiara ranking leaps a digit higher and your chances of winning the contest, one step closer. Having said that your tiara count is a reflection of the number of virtual free gifts that friends, well-wishers and even admirers have sent to your Palmchat ID babe, you’ve just got to get them sending in those gifts over and over and over till the crown is yours. If one beauty is getting this right, that will be Monah Chime, the leading contestant of MISS PALMCHAT 2014 competition. Monah has got more virtual roses (…I mean free, mobile phone emoticon-rose flowers) than a professional florist. Monah leads the second contestant, Diamond Okoh- Obianu (Tiara: 545,100) by a staggering tiaras 565, 700 (www.palmchatnow.com or www. facebook.com/palmchatNow). 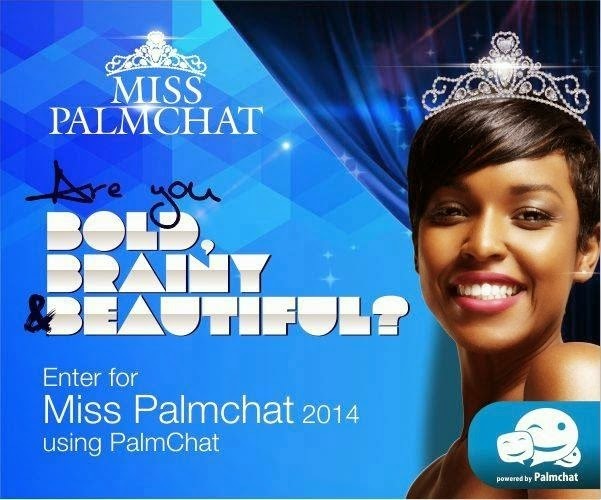 The MISS PALMCHAT 2014 competition for the prettiest and hottest diva on Palmchat is a totally free competition hosted on the mobile social platform at no cost whatsoever…and it is still running! So join the train of divas-to-bes making the buzz. The first ten contestants in MISS PALMCHAT 2014, gets automatic entry into a much grander professional pageantry competition in hosting in the country the same year.